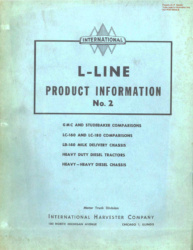 The L and R-Series information on this page was transferred over from the former “Restoring Cornelia” website. 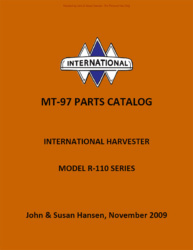 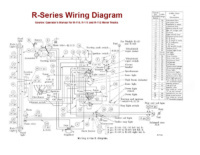 We’ve made available the complete MT-97 Parts Catalog and the CTS-11/12 Service Manual for the L-Series International Harvester trucks with the R-Series supplements. 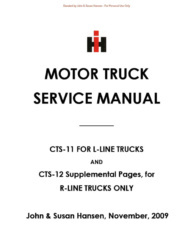 The files are in Adobe Acrobat PDF format, and if you use Acrobat 7 or above, I have taken time to bookmark the sections in the MT-97 Parts Catalog and even more importantly, all of the sections and sub-sections of the CTS-11/12 Service Manual, so be sure that you have bookmarks turned on when viewing in Adobe Acrobat Reader to take full advantage of this feature. 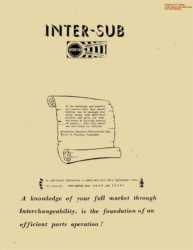 Click on the document image to open a PDF copy. 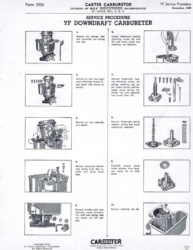 Please note that some of these materials are protected and are for your personal viewing and use only.